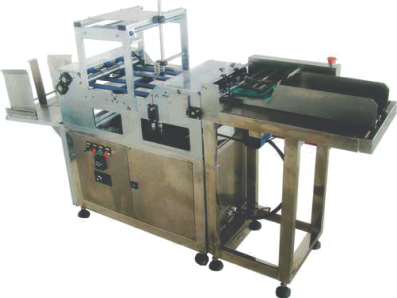 Tyvek Die-Cut lid and Tyvek pouch printer system for printing on large pouches up to 18 inches wide, and medical packaging lidding. 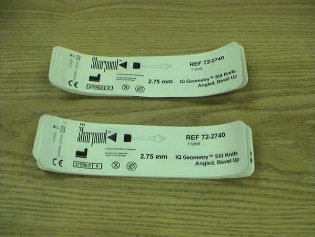 Will print bar codes as well as text for machine readable labeling UDI requirements. Off-line floor based system designed to hopper feed larger medical packaging. Flat items such as Tyvek pouches, die cut lids, lidstocks, non-autotuck cartons, etc. System is designed to be integrated with any in-line Ink Jet, Laser Coder, or Continuous Motion Thermal Printer to provide a printing system capable of overprinting text, logos, 1D or 2D barcodes, date, count, time, etc. For your UDI requirements. Prints directly on Tyvek pouches, medical grade paper pouches and Tyvek lidding. The machine feeds pouches (or Tyvek lidding) from a magazine, and utilizing a laser, ink jet or thermal transfer - prints on the lid or Tyvek pouch. This eliminates the need for a label to print information on die cut lids or pouches. Printing directly on the pouch or lid reduces labor costs for applying labels, as well as the cost of the label. It also maintains the breath-ability of Tyvek, since no label will block the permeability of EtO gas through the die cut lidding or pouch.